What is English 4 Accounting? English 4 Accounting was designed to help teachers organize and improve their English for Accounting classes. It is also a great resource for professional accountants who want to improve their English. Many activities are included such as reading, grammar, listening, writing, and speaking exercises. Our content is written by Accounting, Banking, and Finance professionals and edited by certified EFL instructors. This is not a re-hashed general purpose English course. We teach at intermediate to advanced level. Students require only B2 (Intermediate) level or higher to succeed in English 4 Accounting. We offer detailed reporting for classrooms acivity and grades. Everything the student does is tracked for the teacher or school administrator. Our virtual classrooms offer discussion forums where teachers can post important updates, pdfs, mp3s, and image files. The course includes custom-programmed reading, gap fill, listening, spelling, writing, and speaking activities. Our reponsive design works on any size device. Includes Accounting, Banking, and Finance English certificate that students can download and print out. A built-in QR code is used to help ID verification. Teachers can customize the certificates with their own school names and classes. Inquire about our cobranding options, partnerships, etc. Make your EFL (English as a Foreign Language) and ESP (English For Specific Purposes) more productive. Students who complete the course will get a printable certificate they can share with friends and potential employers. What is the pedagogy behind this? Many ESP (English for Specific purposes) teachers don't even know the subject they are teaching. That's okay. Our content is written and narrated by Accounting, Banking, and Finance professionals, many of whom are certified EFL (English as a Foreign Language) teachers. English 4 Accounting comes in both Student (self-study) and Teacher (blended-learning) versions. Think of it as an interactive "online textbook" which your students can use to practice pronunciation, reading, grammar, and writing skills. Students can be graded interactively or automatically so teachers can use precious class time for group discussions. Students can earn achievements as they progress through the course with the ultimate goal of earning a certification. 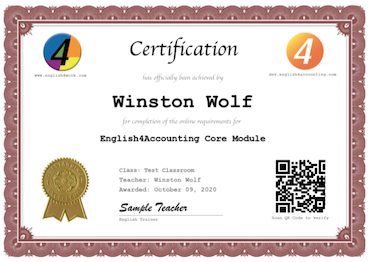 Our software is powered by English4Work.com, a company that specializes in workplace training programs for various industries including: Accounting, Information Technology, Hotels and Tourism, and Medical English. Sign up and get 1 lesson FREE!